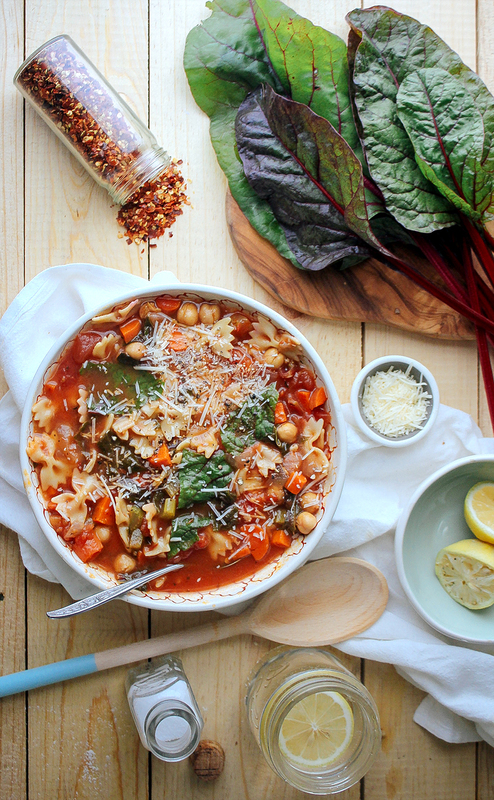 This Chickpea Tomato Minestrone is a simple but flavorful soup ideal for weeknight cooking! Updated October 2016: I made this recipe again and wrote about it here as part of my ‘Throwback Thursday’ series! Feel free to check it my updated notes on it here. When reflecting on past gardens, I can’t help but be grateful for the fact that I was able to have an inground garden this summer. In years past, I’ve always moved in August and had failed attempts with transplanting tomato plants and herbs. This means that the last time I had a real garden was when I was little and my parent’s let me pick out what I wanted to grow. And that was gourds – I remember distintcly only wanting to grow gourds and my parents thinking that was a little funny (although I wouldn’t understand why until many years later… when I realized they are really not very useful in the kitchen). But anyhow, this year… this year I was able to go all out. No more of that half assing tomato and basil plant in a few pots. Nope, Nope. This year I wanted a garden both in the back and side yard (one for full sun and one for part). We planted tomatoes, potatoes, lettuce, kale, swiss chard, scallions, lemongrass, cucumbers, bell peppers, jalapeños, rosemary, sage, and so on. Some of them flourished (lemongrass, scallions, kale, tamotoes) and some of them never quite got off the ground (potatoes, cucumbers…). But whether they grew to monstorous portions or stayed micro size, we tried to harvest and enjoy them. We harvested everything in September but the swiss chard and lemongrass. I’m not sure what I was waiting for with the swiss chard but I knew I was ignoring it until a sign occured. Whether that sign was a must-try recipe or the first frost biting at it’s leaves, I knew I needed a sign. Perhaps it was because the leaves were coming in so beautifully with the colored veins speckled through out them. Whatever it was, I knew I didn’t want to waste these greens by burying them at the bottom of a recipe. ..And if I could only bring myself to harvest that lemongrass before it’s too late! oh Youtube videos… you are just confusing me me! In a large stock pot, heat the olive oil over medium. Add the onion, celery, and carrots. Saute for 5 minutes or until the veggies begin to soften. Next, add in the garlic and saute for another 30 seconds. Then add the tomato paste, vegetable broth, diced tomatoes (with the juices from the can), and oregano. Bring to a boil and then reduce to a simmer. Let simmer for 20 minutes. Add in the stems of swiss chard, chickpeas, and pasta. Let cook for another 10 minutes. Finally, add the swiss chard leaves and let cook for 30 seconds or just until the leaves start to wilt. Remove from heat. Add salt / pepper / red pepper flakes to taste and top with Parmesan. 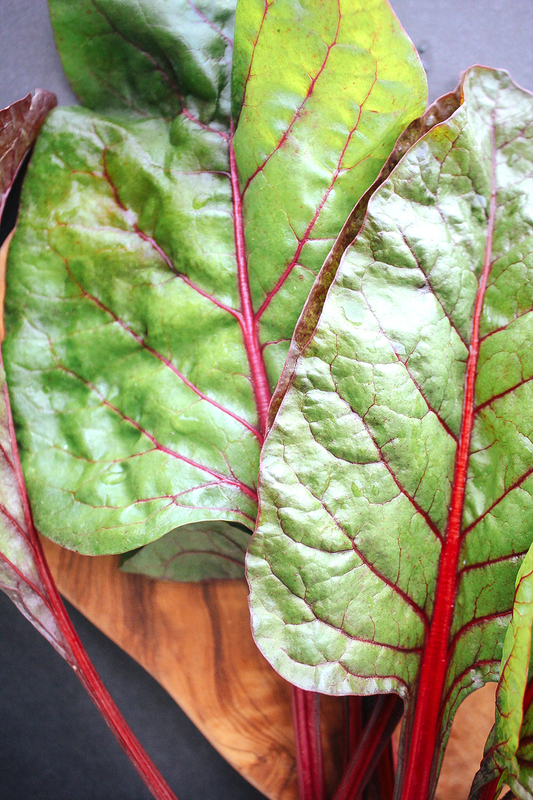 LOVE the addition of chard–so pretty & unconventional. Love love the pictures. Everything about this recipe is good, the chard would be so good in the stew. Lovely. Pinning. I love minestrone soup! The perfect cold fall dinner! And adding the dark greens is a great idea! I love ‘chard! Such a lovely, colorful dish! This is the perfect hearty and wholesome soup for a cold grey day. At least mine weren’t the only ones! I was so excited to make pickles and then they all turned sour yellow instead of green. Ah well, next year hopefully! This looks so wonderfully delicious and wholesome. 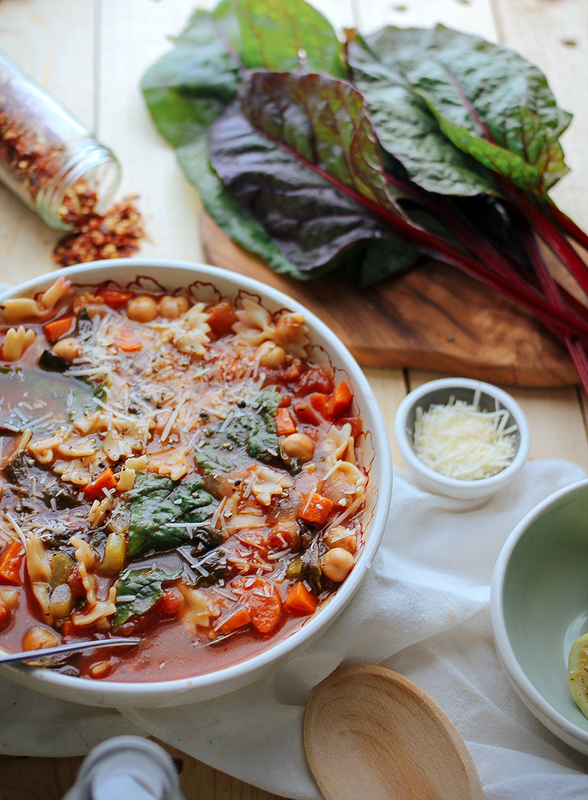 Big pots of minestrone are my go-to meal for busy weeks or when cosiness is needed. I’m equal parts happy and jealous of your gardening endeavours! I am slowly, slowly cultivating a green thumb, but it’s often thwarted by our local wildlife and really bad soil. I guess I’ll just survive vicariously through your success! Oh no! Local wildfires?! That is one problem that I can easily say I don’t have to deal with…. I could see how that could get in the way though! Your photos are looking absolutely amazing! And this soup looks hearty, warming and wonderful. Shelly, this is a gorgeous post. I love, love that recipe and your photos as usual are stunning! So glad you were able to rescue that gorgeous chard!! Ugh, what an awful visual picture! I could have sworn the Parmesan that I get at my co-op is stamped vegetarian but I’ll need to double check now. You can get lots of Parmesan style cheese that tastes the same but just doesn’t contain the Rennet. You can even get great Vegan Parmesan which is weird! But still so good! But its under some rural traditional Italian law that it has to! sounds great for a cold day like today! oh my belly is hungry for this immediately. this recipe is gorgeous and practical and i will make it, that’s for sure. What a cozy bowl of soup! I make a somewhat similar recipe from one of Moosewood Restaurant’s made-for-kids cookbooks on the regular- it uses loads of garlic, carrots and tomato juice, but so easy to cook up! I’m awful at budgeting time to chop veggies, and it allows time to cut them up while other things simmer! That sounds delicious! Anything with loads of garlic and I’m in. Hi! I just recently found your blog and I’m dying because I love it so much. Your photography is incredible, I can’t get over how awesome you make everything look! I am also vegetarian so I’ll be trying out your recipes. 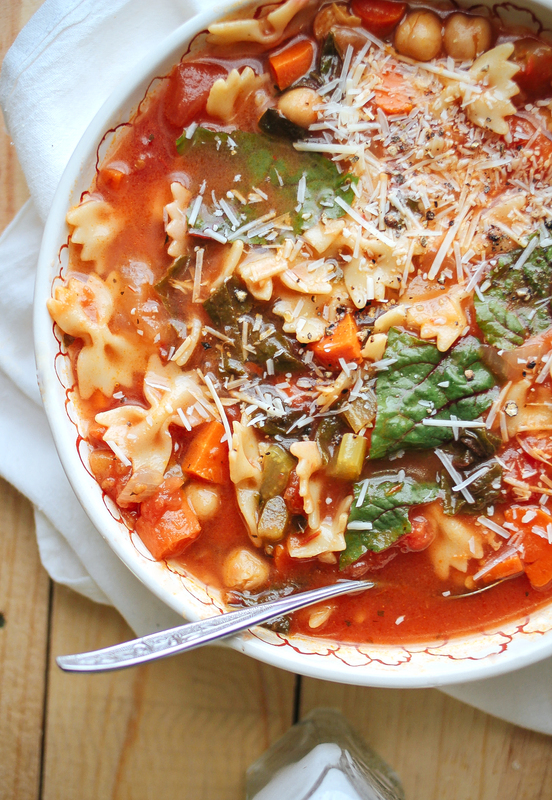 I’m running off to the grocery store right now to pick up veggies for this soup. I’ll let you know how it turns out! You’re awesome, don’t stop blogging!!! Hey Catherine – thanks so much for the kind words!! Can’t help but love positive feedback like this! Please let me know how the soup turns out for you! This was fabulous! So fresh tasting and delicious…even my toddler gobbled it up! Wouldn’t change a thing. just made this tonight. What an incredibly tasty soup. I just shared the recipe with a bunch of friends! Thank you! So glad to hear it!!! I absolutely love knowing people are trying out my recipes! Delicious soup! Except I substituted pasta with quinoa, which has much more protein and health benefits. Yum! Love the quinoa idea! Will most certainly need to try that next time! Do you cook the pasta before adding it to the soup? Nope – you’ll add the dried pasta and keep the soup simmering for 10 minutes which will cook the pasta all the way through. Hope that helps! How do I print the recipe “Chickpea tomato Minestrone with vegan options” without including all the comments on the bottom. I’ve made this recipe at least 5 times because it’s absolutely delicious in every way and tastes even better leftover. I’m not a huge Swiss chard fan, so I sub kale or spinach but no matter, it’s awesome. Thanks! This was so easy and delicious. 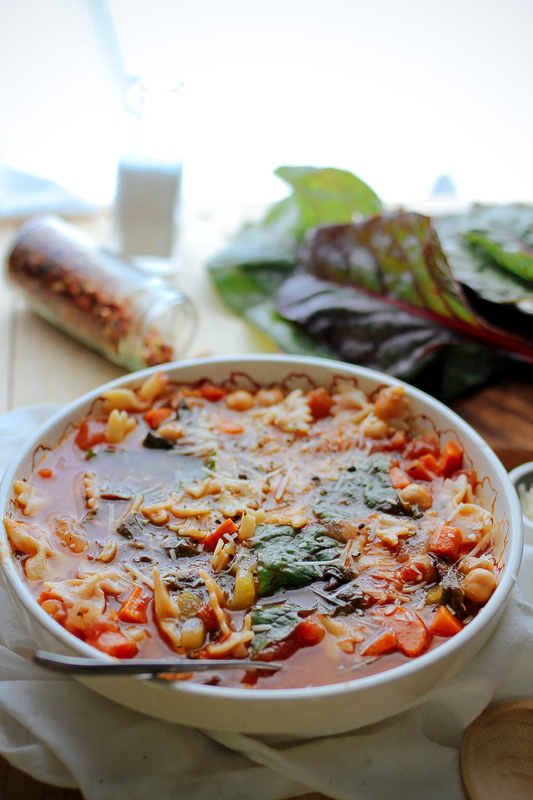 I loved the chard as well but never added red pepper flakes to my minestron in the past. Really liked that little bit of heat. Thanks! Yup! I would just wait to add the Parmesan until right before serving. I will say that the pasta doesn’t hold up as well once frozen but it’s still delicious. This is delicious! I’ve made it multiple times and am making it again tomorrow! One of my husband and my favorites!